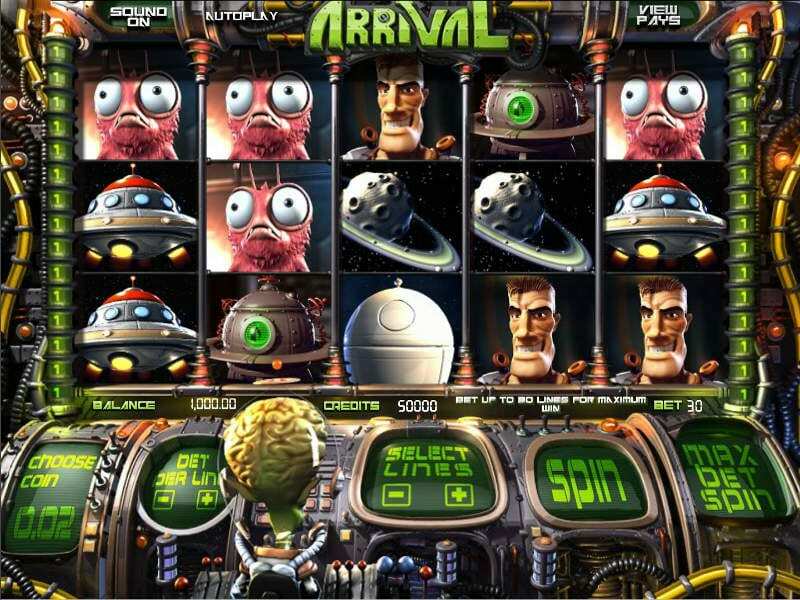 The motif of the Arrival slots game fits squarely in the science fiction genre of slots games. It is designed by BetSoft and has a fantastic 3D interface. As such, it enjoys many high tech animations and graphics, a surround sound audio track, oversized mother ships, asteroids, planets, a starry background, and menacing aliens in “bad guy” space suits. Combined, these symbols complement the kiddie space marines. Additional symbols in this futuristic slots games are represented by a Saturn-like planet with rings; Space Medallions worn by the space cadets; the space cadets’ pet that has only one eye; earth; an auto-bot; smaller spaceships; laser guns; and male and female space marines a/k/s the space cadets. The soundtrack is loud and full-bodied like similar Star Wars-type movies. Unfortunately, it is set on a too-short loop and the repetition of the same refrain over and over can become monotonous. Space-themed slots games are programmed to keep play momentum at the maximum activity level. So when you slow the pace too much, the alien at the controls becomes irritated and prompts you to pick up the speed or at least stay active while playing the game. The game sports a fancy 5-reel set of spinners and a reasonable number of 30 paylines. The playtablecomprises that of the wall-to-wall, floor-to-ceiling control rooms now familiar in most modern space movies. The line selectors, Spin controls, and bet selectors function as integrated controls of the huge control screen. The menacing space alien is in control of the control buttons. There is a very narrow betting range from two cents to 50 cents, which means that you won’t be able to retire by saving your winnings from this slots game. Per payline, the maximum number of coins you can bet is five. You can hit the Jackpot by betting the maximum number of 75 coins on each payline and get either ten thousand coins or NZD5,000 in cash. The game lacks an auto play function but it makes up for it by having a pleasant and simple to use interface. If the Laser Gun Scatter symbol appears three times on any payline or reel, a UFO Click Me tool is activated and the three Laser Gun icons transform into Click Me icons. The game prompts you to click on each of the three Click Me symbols to win free credits until you see the Collect symbol. The young female space cadet acts as the Bonus symbol and she activates the Bonus Rounds, which requires the player to follow her to the Evil Alien’s spaceship and thereafter rescue her. The Bonus Rounds and the rescue mission are the combined apex of the game. It’s fast-paced and exciting and will most often reward the player with extra winnings. The rescue mission and triggering the Bonus Rounds are not easyto achieve in the Arrival slots game. Arrival is a unique and exciting 3D slots gamethat can be played by any member of the family on land-based systems and online at home in your pajamas. It’s either free or cheap to play, exciting, not complicated to play, and takes you on an adventure. What’s not to like about it. Give it a try.